A lot of startups work remotely. Today, there are a lot of tools that enable collaboration across locations. Sadly, the same is not the case for conducting the interview process, especially when it comes to facilitating an open ended discussion. Collaboration is like democracy. It’s great but can get messy. That’s why apps which concentrate on giving a open forum experience have more user engagement. People can annotate, comment, quote to make a point or communicate on, to make a difference and to gain a constructive progress in the discussion. 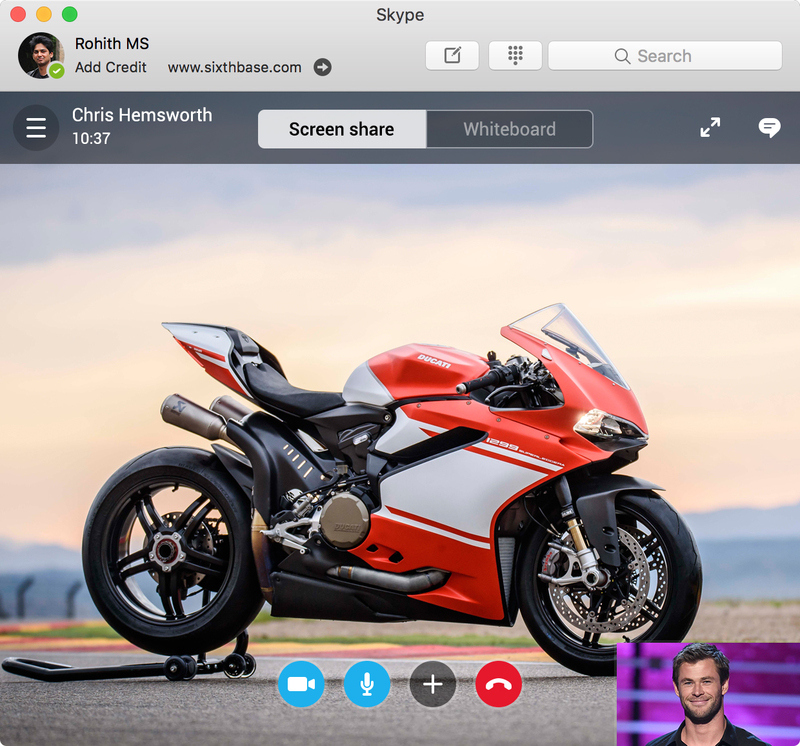 Skype as a platform/tool is used in a massive way to communicate and used generally to conduct remote interview calls. Goal is to design Skype or to introduce a section in it, which can work as a tool for Designers and Product Managers during the interview process in a seamless manner. 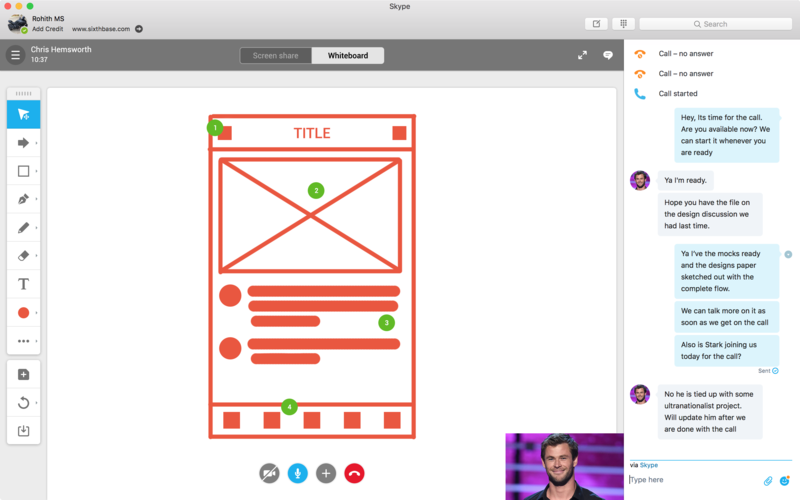 I'm trying to design a extension of screen share in Skype where users (Designers & Product Managers) can have a platform where they can document, write, scribble which makes it even more easier to share ideas among the group. Either of the users take turns presenting screens in a presentation. Or open a document or a board through the app to showcase idea for more brainstorming. Carefully selected features presented in the right way which caters to all the usability needs is what builds a experience. I began the project by doing my research on Photoshop, Sketch UI & blogs by various users and also screen share platforms like Go to Meeting, Hangout & more to understand the thought process behind the UI which caters to the needs of so many designers worldwide. When I got at a clearer idea after my research, I extracted snippets from my scribbles and started making note of it. Goal was to build a tool that facilitated a stage where the Designers and product managers can engage in a fruitful brainstorming discussion with user engagement and being rewarded in the end. Next step was paper sketches, I started sketching out my thoughts before I transitioned to higher fidelity mocks. This gave me speed as I could put all my design concepts on the paper first. I started to write down the content also that would further define what I’m planing to design to make the process faster. 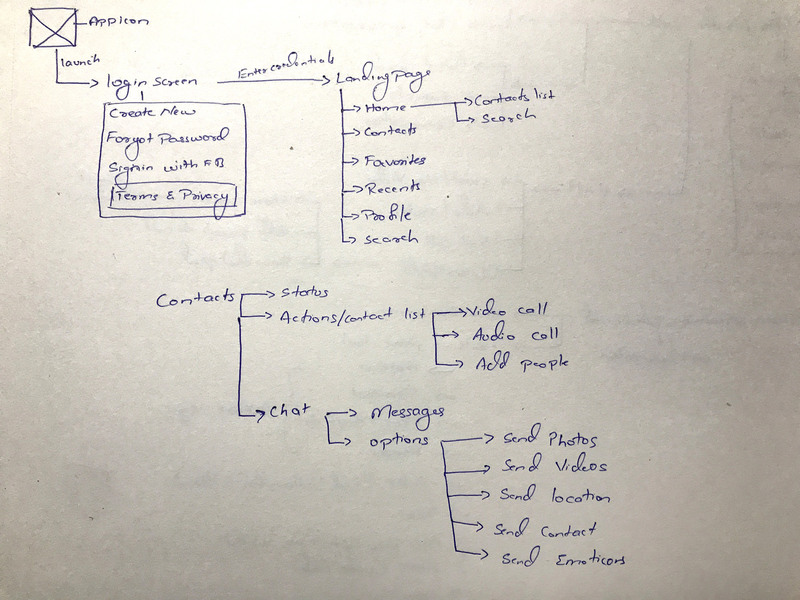 With the paper sketches on my side, I started with the initial Functionality Flow to make it more full proof and to capture the features more constructively. 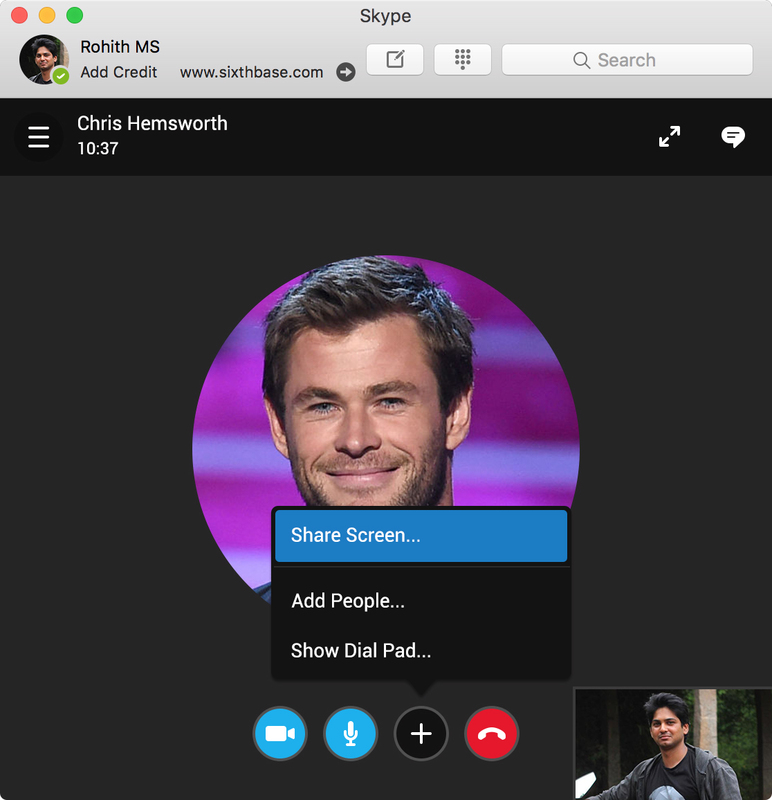 So the idea is to showcase the flow with the steps which are currently integrated with the skype app. To give a more user centric flow. 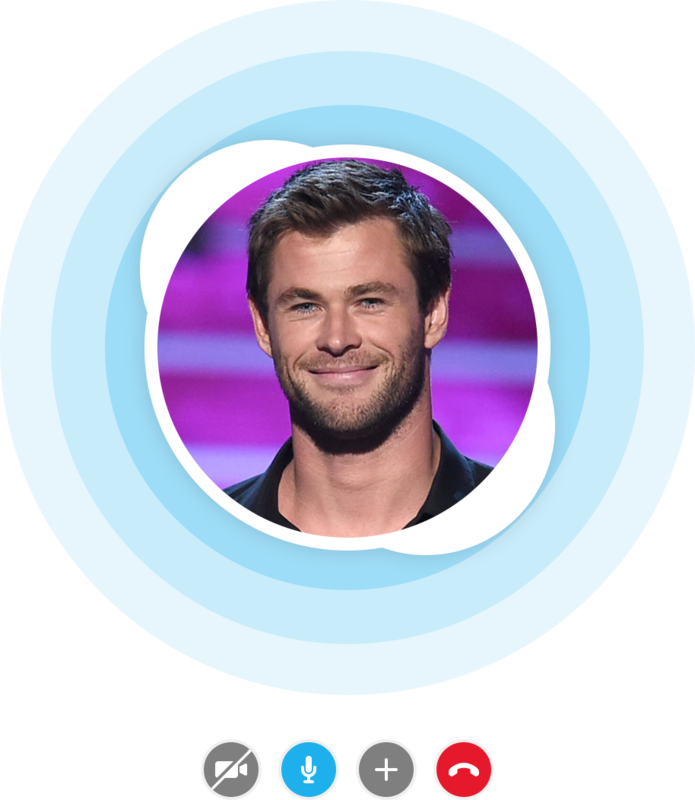 Select the person you want to have a discussion with and call them in an instant. User can choose the option to do screen-share which opens up a lot of possibilities for larger things which can help in better engagement between the two users. 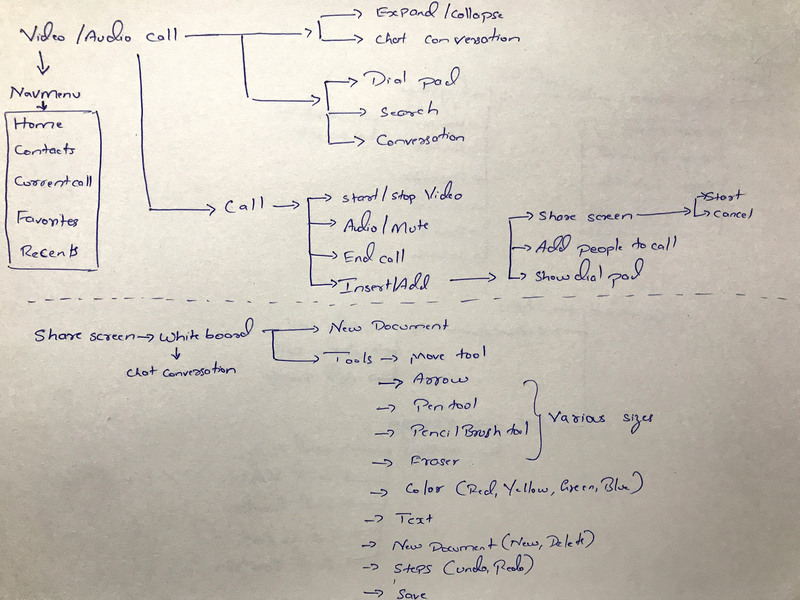 User can do the regular basic conversation and shift to the white board section to do more than just communication. 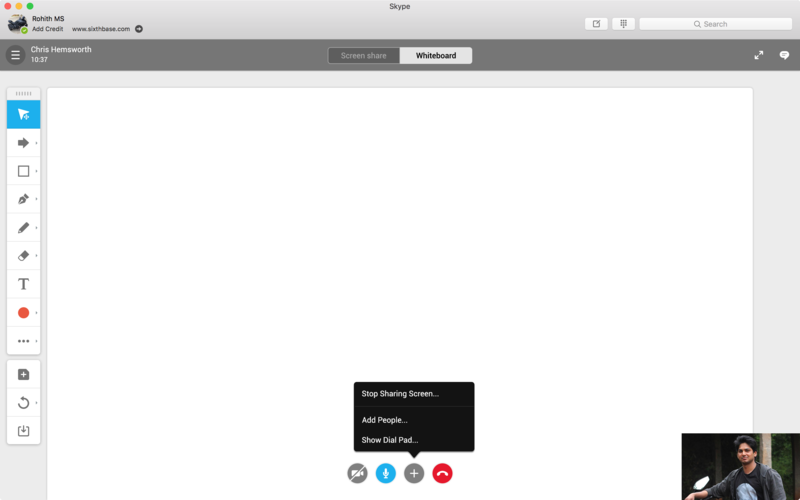 The next step helps the user in collaborating with the other person on Skype to create simple, minimal structures by usage of specific tools which helps in better understanding of each others thoughts to arrive at a tailored decision. User can tap on the Whiteboard section on the segmented bar on top of the navigation bar to access a document screen where the users can brainstorm by using the tools on the left to gain a constructive progress in the discussion. 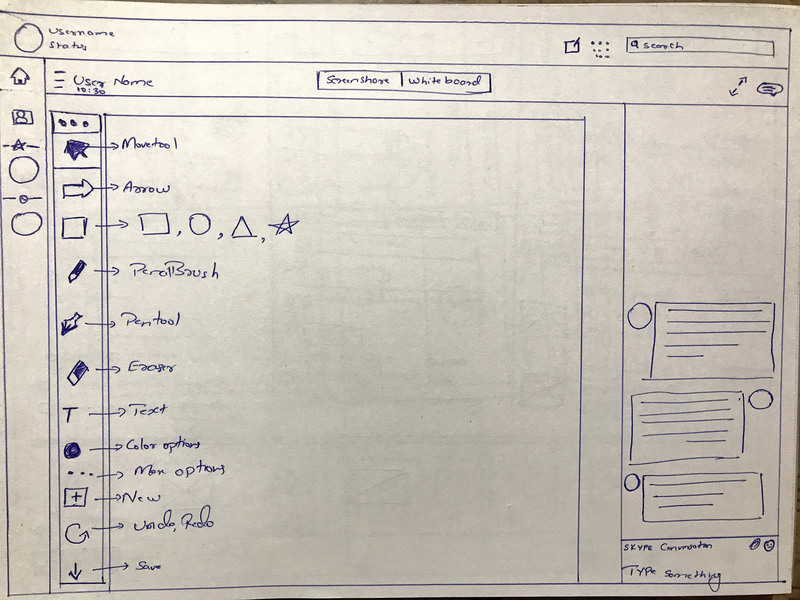 The app layout has been built by keeping apps like Adobe Photoshop & Sketch in mind where the user finds the tools on the left which makes it look and feel like a familiar UI app, which makes the interaction for the Designer faster to sketch out the ideas on the whiteboard layout to convey his/her thought in a comfortable manner to the Product manager on the call. As you can see below, users can sketch out there ideas, be vocal about the discussion and arrive at a conclusion in a seamless manner. Whiteboard helps in connecting the thoughts and ideas much more easily than they could do before. 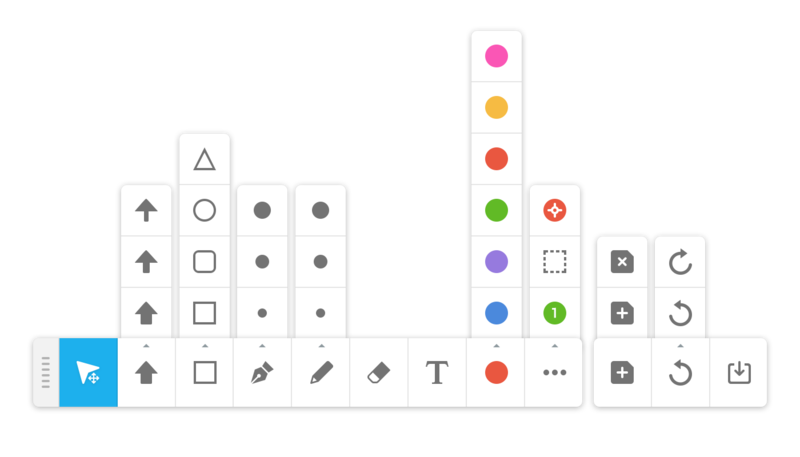 Creating the design tool box was one of the most interesting features and experience within the app. Ultimately, they’re designed to give users a native UI design app experience in the most simplest and minimal way possible. Every single action has more options in them which can be accessed by pressing and holding like how Photoshop or Sketch works. These are the options which have been carefully selected as they are the most used & reliable when it comes to design. The app even gives you a popup dialogue box after the conversation to save the file, so that you don't miss any key elements or ideas which were discussed upon.